Feeding your chickens a balanced diet is a very straightforward affair these days. With the advent of properly formulated mashes and pelleted feeds (pic above) we have a convenient and clean way of providing a perfectly balanced diet whatever the particular demands of your birds. All ages are catered for from chicks, who need tiny, high protein, crumbs to growers and layers formulations as they develop. These prepared feeds should be offered in specially designed feeders that have segregated compartments or you will find pellets all over the floor in no time at all. These are best used suspended on a chain at a height that allows easy access but also helps avoid soiling by dirt and faeces. While it is entirely possible that a chicken allowed to free-range would be able to forage an acceptable balanced diet for the keeper who needs to confine their birds to a greater degree there is very little need to feed anything other than these formulations. However, as small-scale keepers it is perfectly understandable that you may want to supplement your birds’ diet with more interesting snacks or treats from time to time. 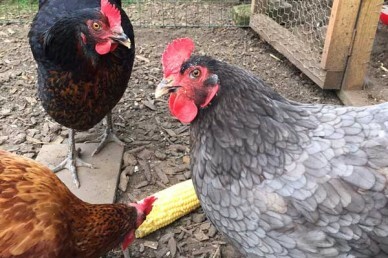 There is nothing to stop you doing this and they will enjoy scratching around for a handful or two of mixed corn in the afternoon or pecking at a head of broccoli or cabbage suspended from their run. They will also enjoy sweetcorn, strawberries, grapes or even grass clippings as well as the occasional worm or slug if allowed to roam. It is important to ensure that you keep treats and supplements as a small percentage (no more than 10-20%) of actual intake to avoid upsetting the balance of nutrients. Avoid avocados and uncooked potatoes especially if they are green. Contrary to popular belief mixed corn or wheat alone is not a suitable diet, especially for layers. Note: Maize fed in the afternoon when the weather is cold will help to keep them warmer at night. Feeders, even those with built in covers, should be positioned in a sheltered area as rain still tends to find its way in and you could quickly find several kilos of feed ruined. Store feeds securely, clean up spills and bring feeders in at night to avoid attracting vermin. 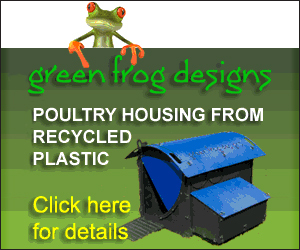 Sturdy plastic dustbins with tight fitting lids are good for storing feed. During certain times of year your chickens may benefit from and increase in certain nutrients. During the moult extra calcium and protein can be beneficial and during winter a slight increase in protein can also help them through very cold weather. 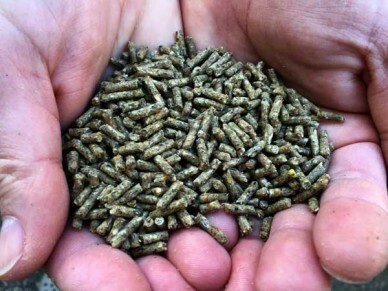 I find the mixing in growers pellets with their usual feed adds just enough extra protein and egg shells, baked to kill bacteria, crushed finely (so they don’t recognise them as eggs) into their food is a good source of calcium. In a complete turnaround the traditional practice of feeding food scraps from the kitchen to chickens is now banned by DEFRA. If you wish to treat you should do so using foods that haven’t been through any kitchen preparation or use spare produce from your garden. Chickens drink a surprising amount and should always have a supply of fresh water available. 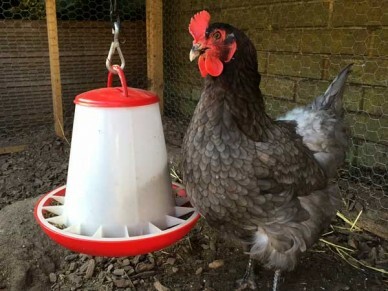 Gravity fed drinkers provide a convenient way of keeping your birds hydrated and, again, should be suspended to avoid soiling. In winter ensure water doesn’t freeze either by checking regularly, clever positioning or with the use of a suitable heat mat. If your birds are not free ranging poultry grit should be freely available as this sits in the gizzard and aids digestion by helping to grind the food. Oyster shell can be made available as a source of calcium but isn’t generally necessary if feeding a balanced diet.